Three-bedroomed Villa Iki in charming Kalkan, on the Turkish Mediterranean coast, has everything you need for complete relaxation. 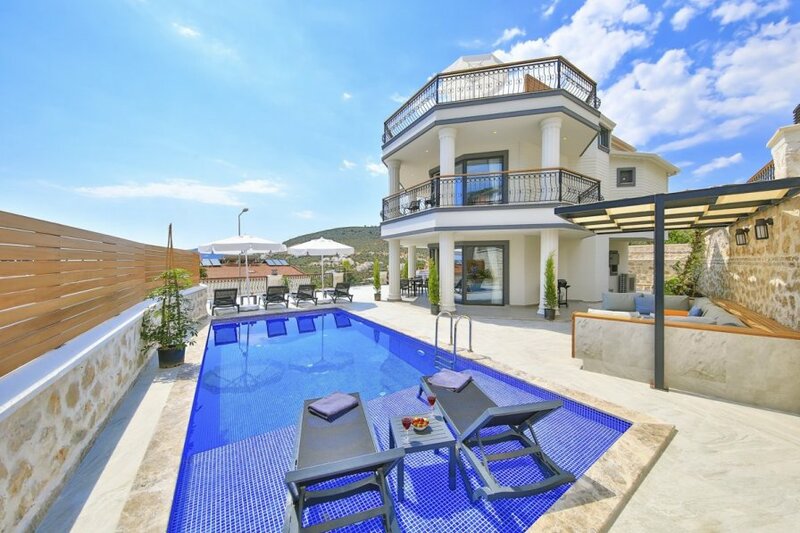 Three-bedroomed Villa Iki in charming Kalkan, on the Turkish Mediterranean coast, has everything you need for complete relaxation. It's sitting pretty on the tree-lined hillside with magnificent views of the bay. Take a cooling dip in your private swimming pool or dine al fresco on your spacious sun terrace; with access to another large pool, top-notch restaurant and bar at the nearby hotel there's almost no need to leave, but the town centre with bougainvillaea-draped houses awaits you below. If you can bring yourself to leave this luxury villa, Kalkan town centre is a short 10-minute' walk away. The old fishing town, turned popular holiday destination, still retains its old-school charm and laid-back atmosphere. Head to the harbour with waterfront restaurants, browse the boutique-lined streets or head to the bay for swimming or afternoons on the sand. Of an evening the sophisticated roof top restaurants are a gourmet's delight.With the majestic Taurus Mountains nearby alongside ancient sites and exciting walking trails, you won't be disappointed. Villa Iki is in the Kiziltas, a beautiful area of Kalkan on Turkey's coast. This friendly and laid-back harbour-side town boasts the majestic pin tree-lined Taurus Mountains as a backdrop and has a grand sweeping Mediterranean bay. It's a fantastic base to visit the Lycian ruins from or engage in the many local activities. Apart from the main pebble beach near the marina, where you can swim in the sheltered waters or relax on the soft sandy shores, there are many beach clubs set into the rocks, offering restaurant and bar service to your sunbed.